Storytelling is very straightforward, every aspect very well explained. You did not mention, that by cascading those OpAmps, your initial/superior goal of high precision DC gain will deteriorate. One stage only will give 2 x 0,05% DC max. error, 2 stages will double that worst case value by 2 because you will have 4 instead of 2 uncertain resistors. The probable error might follow a SQRT law, therefore 2 stages will increase uncertainty by a factor of 1,41 at least. Anyhow, a fundamental error analysis, plus data from your series production / testing would make up a nice next-next-next fundamental Friday, I suppose. The probable error might follow a SQRT law, therefore 2 stages will decrease uncertainty by a factor of 1,41 at least. It would be an improvement when you are trying to read the amplitude of some short transient current, but the delay would be something to keep in mind. Great video... entirely too few fridays in Dave's calendar. I normally use slew rate. The GBW is nice but says nothing about the amplitude of the output. changed to a triangle due to the slew rate limit. A method I used to get a 10:1 divider is a 8 resistor network. The resistors are all from the same mix of resistive material therefore they temperature stability tracks very well. Generally get better then 0.1% ratios with high temperature stability, only have to by 1 part plus not very expensive. Interesting & noted down, thanks. Sorry but I'm missing something here, I cannot see why the bandwidth of an op amp will change depending on what gain you set it at. All that is in the feedback path is two resistors so what causes a device that works at over 2 MHz at unity gain to only work at a few KHz? 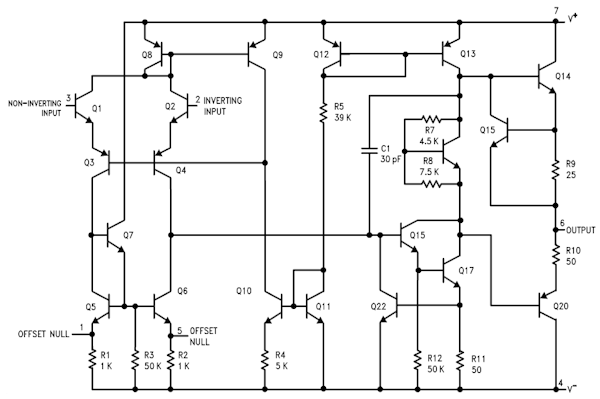 To get a stable opamp it is internally frequency compensated with what is called a dominant pole. The result (again simplified) is that an opamp behaves like a first order low-pass filter with -20 dB/decade frequency response. I.e. the low-pass behavior limits amplification at higher frequencies. Actually, as an EE you should know that from your introduction course to opamps. EE, Electrical Engineer, normally I work on bigger stuff such as 10Kw motor drivers but I do the smaller stuff like this for fun. I think you should create a video on bandwidth as it applies to electronics as I don't even know why you needed more bandwidth in your micro current.. was it for response time of the input? Make tests quicker. When I search online and YouTube I find so many variants but nothing a newbie like myself can understand. For a two resistor ratio of 9:1, what could be better than 1k8 and 200R? Thanks! That answers my question. Tomorrow I will be playing with some op amps. Need to get a scope soon so I can see what the wave form looks like and such. in the video, Dave mentions that it is better that we apply the whole gain in one opamp for a couple of reasons, what are the reasons behind this?